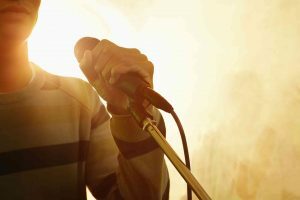 Did you know rock concerts can contribute to hearing loss? It’s getting loud in here! As we approach Memorial Day and the end of May, summer concert season is fast approaching. Rock concerts, in particular, see an upswing in traffic during the summer months. Did you know rock concerts can contribute to hearing loss? Read on to learn more about how you can protect your hearing and still enjoy all those rocking bands that are going out on tour this summer. The advent of rock music was in the middle of the 20th century. Ever since then rock music has known to be loud. What made it so popular, and what set it apart from its stuffy musical forebears? While the roots of rock and roll came from other types of music we still enjoy in the present, it’s the attitude of rock music that makes it so unique. But hearing loss isn’t so rocking. In fact, live music has been found to be played at 135 decibels or so – enough to hurt more than just your ears. And did you know famous rockers such as Sting, Bono, and Neil Young have all confessed to suffering from some degree of hearing loss? Turning it up to eleven may be great if you’re a fictional rock band in a movie. But, it’s not so great for your hearing in real life. Protect your hearing. How can you do this, and still have a rocking time at your favorite bands’ concerts? It’s quite simple, really. Silicone earplugs are useful for concertgoers and musicians alike. While foam earplugs can block and distort all sorts of sounds, silicone makes the sound less harsh on your eardrums. After coming home from any rock concert, you may detect a faint ringing in your ears. Or, you might have some lingering ear pain. Both are normal aftereffects but are not necessarily signs of ear damage. Even so, every time you listen to loud music, you risk damaging your ears. And since ear damage has no cure to reverse it, your best bet is to do the best you can in preventing and mitigating any possible ear damage. This entry was posted on Friday, May 12th, 2017 at 2:40 pm. Both comments and pings are currently closed.